AU REC. DE 1911 ELLE HABITE CHEZ SON FILS JOSEPH. PAR/MAR: ABRAHAM FLORENT ET EMILIE PINARD. 03-1865 AU REC. DE 1911. PAR/MAR: ABRAHAM MARTEL ET MARIE LAMPRON. 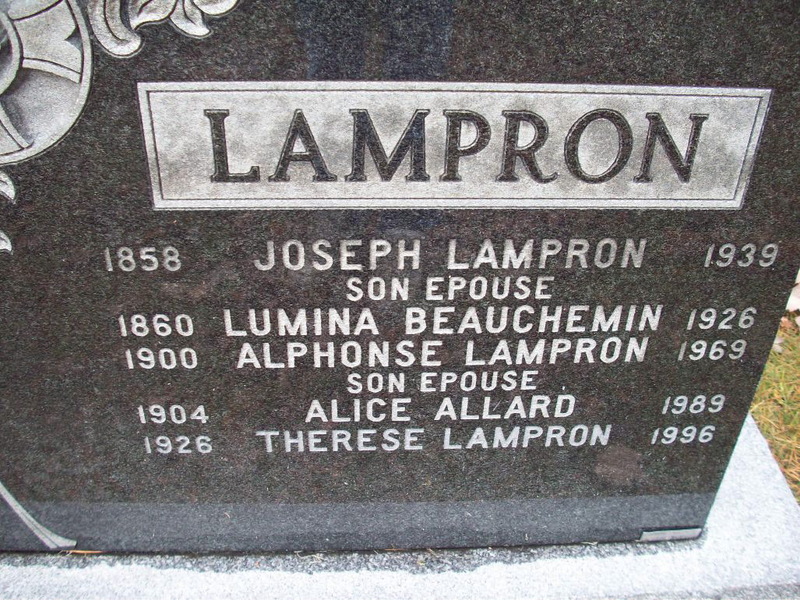 par/mar: ABRAHAM LAMPRON ET HERMENIE LAMPRON. par/mar: HUBERT VINCENT ET HELENE LAMPRON. PARR/MARR: JOSEPH PROULX & JEANNE PRÉCOURT. parr/marr: hylas courchesne & élisabeth lampron (tante). PAR/MAR: JOSEPH LAMPROHON ET SEVERINE GEOFFROY. 18-12-1883 SUR LE REC.DE 1901, IL EST DIT ELFRID. PAR/MAR: HUBERT LAMPRON ET DELIA DUVAL. PAR/MAR: ONESIME CLOUTIER ET CELINA VINCENT. PARR/MARR: ONESIME LAMPRON ET SOPHIE TOURIGNY. 3 MOIS, ELLE EST DITE YVONNE SUR LACTE. AU REC. DE 1911. ELLE VIVAIT CHEZ SA TANTE ALMESIME LAMBERT AVEC SON FRERE ROMEO. 22-4-1884 AU REC. DE 1901.
par/mar: GEORGES JUTRS ET CLEMENCE LAMPRON. AU REC. DE 1901 IL VIVAIT AVEC SA FEMME CHEZ SON PÈRE ONÉSIME. SUR LE REC. DE 1901. PAR/MAR: ONESIME LAMPRON ET SOPHIE TOURIGNY. 23 mars 1900 SUR LE REC. DE 1901. PAR/MAR: ALPHONSE LAMBERT ET LYDIA BEAUCHEMIN. 31-04-1877 AU REC. DE 1901. Par/mar: Joseph Beaumier et Louise Therrien.